Bob Hathaway first appeared in The Great Connection as a radio talk host confronted with a format change opposed to his nature. He met Doc Crater who guided him through his struggle and set him on his true calling in life: teaching men and women the power of the four behavior styles, how to interview others to determine their style and the exact words to use to connect with them. The Great Connection is the story of life's most vital lesson: how to connect with other; especially yourself. Over 100,000 have read it in 11 languages. Now, The Great Connection Sequel: Devon. Bob Hathaway returns to his alma mater as Speech teacher and Advisor. You'll witness how the characters benefit from Bob's timeless lesson: how to prepare and deliver a speech, basic punctuation, a simple self-assessment check list, and much more. In Devon's grand conclusion, with a surprise ending, he shares his inspirational parable: The Little Red Wagon. 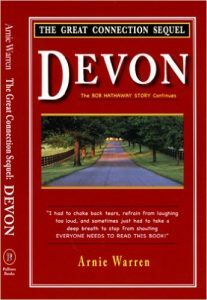 Devon is rich with unforgettable, applicable, practical wisdom. Doc Crater was Bob Hathaway's mentor; Bob will be yours.